1. Preheat oven to 400 degrees Fahrenheit and line a baking sheet with parchment paper or non-stick spray. 2. In a small bowl, combine tahini, water, salt, paprika, lemon juice, garlic powder, oil and nutritional yeast until a smooth sauce is formed. 3. 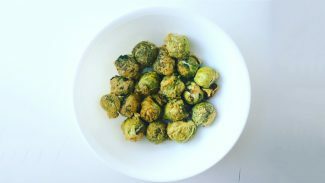 In a medium sized bowl, toss brussels sprouts with sauce until pieces are nearly completely covered. 4. Lay brussels sprouts out on baking sheet and top with more nutritional yeast, salt and pepper. Next, place in the oven for 30-35 minutes, turning over halfway through to ensure even roast. Once slightly browned, remove and enjoy!